There’s no doubt about it; raising a baby is expensive. With all of the different things you need to buy for both your nursery, being out and about, and simply supplies, you might be tempted to buy or borrow some second-hand stuff. However, this isn’t always a safe idea. Baby gear is recalled all the time, and sometimes there are specific risks to different items that you might not even be aware of. This is especially true when it comes to crib mattresses, and the short answer is: no, it’s not a good idea to reuse a crib mattress. One of the more obvious reasons not to reuse a crib mattress is because of sanity concerns. Crib mattresses get peed on, repeatedly. You can never be 100% sure that it was cleaned and treated properly, and even spilling milk or other things can lead to mold growth and worse if not cleaned properly. You can also never be sure of what’s going on inside the mattress; if it was stored improperly or in a damp area, the interior could be a host to fungal and bacterial growth. Gross. Bed bugs are also a concern with any used furniture, and that includes crib mattresses, and they’re not always visibly noticeable. This is an obvious concern if you’re thinking of buying one online from someone you don’t know. Mattresses don’t last forever, and one that’s been used for a while might simply not be safe to use anymore. Crib mattresses should be as firm as possible, and if it’s been used over time, this might not longer be the case. They do lose firmness over time, especially if used for years. The condition of the mattress is also very important. If it has any kind of tears or holes, it should not be used, period. 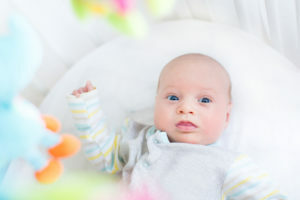 In 2002, a study by the British Medical Journal concluded that there was a significant link to having a used crib mattress and SIDS, especially if it was from another home. The reasoning why was not known, but it was thought that it could be the baby’s bodily fluids being trapped in the mattress, leading to bacteria that the next baby is exposed to, in turn leading to an increased risk of SIDS. Because of all the risks associated with used crib mattresses, it’s not recommended. However, there are low-cost alternatives and buying a budget crib mattress doesn’t necessarily mean it’s going to be a low quality one. Consider reading our guide on buying crib mattresses; it will be a big help!